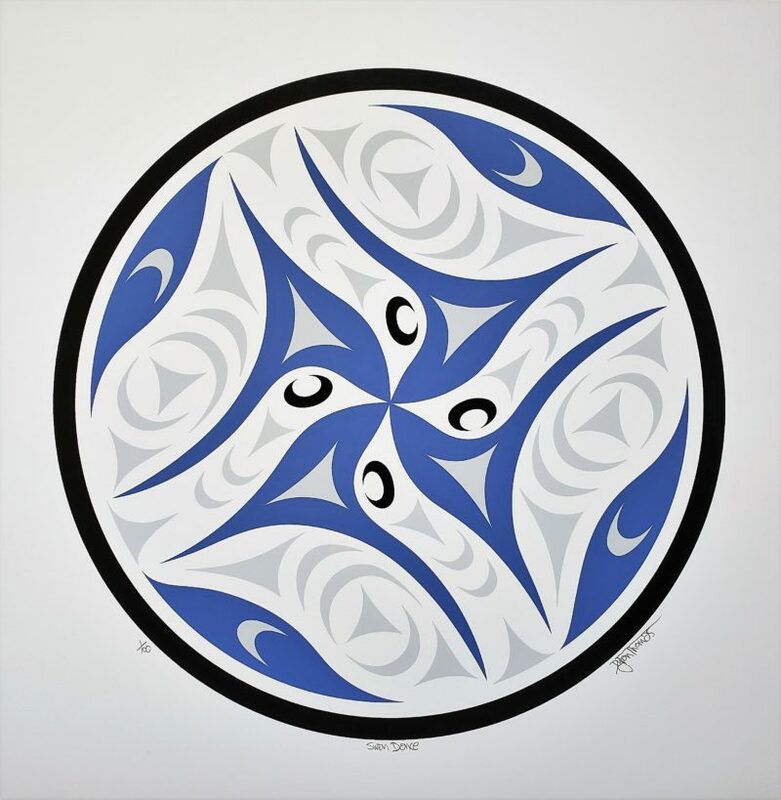 "While swans are fairly rare in Northwest Coast art, they have a rich symbolic history around the world. From folk tales such as “The Ugly Duckling” to Tchaikovsky’s ballet, “Swan Lake,” Swans aesthetic natural elegance make them a fantastic animal for artistic portrayal, and I’ve always been drawn to their flowing aesthetic form. In this design, I was inspired by the swans’ hypnotic mating display where pairs of swans engage in a long and charming synchronized dance across the water. With stunning precision, the two birds mimic each other’s movement in graceful circles and figure-eights. I wanted to capture this movement by using the spindle whorls circular structure and employing rotated symmetry to capture their synchronized movements. Using four birds, I had each individual swan share its wing with the two beside, symbolizing the intimacy of the pairs." This limited edition silkscreen print titled "Swan Dance" by Dylan Thomas was hand produced by the screen printing process. It is the only limited edition printing of this design. The artist has inspected and signed each copy in the edition. All trial copies of this edition have been destroyed and the printing stencils obliterated.